exhibit A and B: "jammy's lies"
On Saturday, March 25th, 2006 West Indian Times was alerted by veteran artists and producers in the Reggae industry to the existence of 2 separate recordings of conversations which included death threats towards Dub Engineer Hopeton Overton ‘The Scientist’ Browne and Producer/Label owner Hyman ‘Jah life’ Wright as well as admission of perjury in a US court by King Jammys. 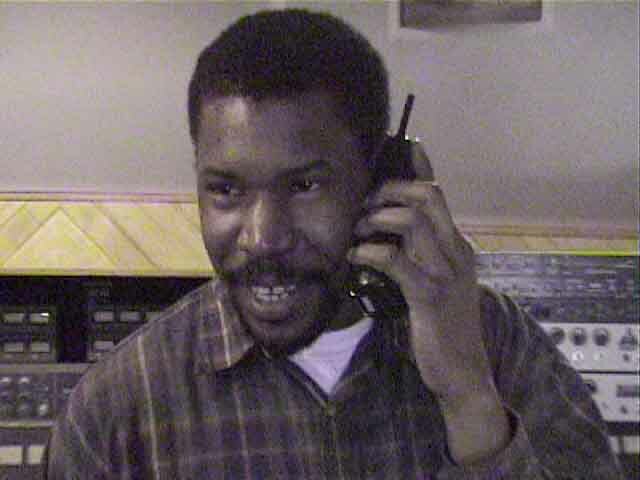 One of the recordings is a conversation between King Jammys (a record label/producer based in Jamaica) and Dub Engineer Scientist who is based in America and the other recording is of a conversation between The Scientist and a man who stated that King Jammys was his boss. After listening to the recordings West Indian Times spoke to Browne and Jah Life to find out what led to the death threats. We were given history that spanned over 30 years in the music industry; history, secrets, facts that only a few are privy to. For now, we will share with you our readers the information we were given as to what directly led up to the death threats against Scientist and Jah Life. In 2003 The Scientist filed a law suit in the United States Federal Court against Greensleeves record label (based in England) and the company RockStar the makers of the game ‘Grand Theft Auto’ for copyright infringement. The Scientist had challenged Greensleeves for the recording and composition copyrights of five tracks which they used on the video game, Grand Theft Auto 3. The music was originally from one of The Scientist's albums that was released in the 80's entitiled 'Scientist Rids The World Of The Evil Vampires.' The Scientist’s music was included in the violent video game without his knowledge or consent. Greensleeves had made a deal with RockStar for the company to use the music by The Scientist and when Greensleeves was asked by RockStar if they had the rights to the music they said they did. Greensleeves indemnified Rockstar meaning they would be responsible for any costs incurred if there was a claim by any person stating that they had rights to the music. In the US court Greensleeves had to produce the documents that were signed with RockStar for Grand Theft Auto, they had to produce the shipping bill and all the information regarding pressing. Greensleeves also produced a document which was alleged to have been signed by a producer and marketing rep who represented both Jah Life (US) and The Scientist (Jamaica) overseas. This producer/marketing rep. was Henry ‘Junju’ Lawes. The document was signed in approximately 1978 and showed where Greensleeves paid Junju for music. They also produced a second document which was allegedly signed by Lawes around 1994 before he died. The second document signed by Lawes basically gave ownership and copyright of music by over 30 artists to Greensleeves. However, nowhere on the contract did it mention an amount that was paid for the copyright ownership. There was also a question in court as to the validity of the documents signed by Junju Lawes as he was illiterate and Greensleeves knew this, in fact both Jah Life and Scientist say that Greensleeves would not work with them, only through Jun Ju as they could get away with fooling him as he could not read or write. Scientist and Jah Life claim that this is why Junju was named as producer on over 30 + albums that he took to Greensleeves instead of them. Also, it was noted that both contracts had identical signatures, no deviation and even had the same smudge marks as though the second signature was cut and paste from the first contract. Another artist, veteran DJ Lady Ann also spoke to West Indian Times saying that she was there in the studios most of the time with The Scientist and that he was the best mixing engineer of those times. Lady Ann said that King Tubby’s studio was the worst place in Kingston, she said you had to pass gunmen who would ask if you are PNP or JLP in order for you to get past and you had to answer ‘Musician’. Lady Ann said that Jammys (who was Prince Jammys at the time) would not go to the studio because it was too dangerous and she knew that Jammys was envious of The Scientist because of the trust and faith that King Tubbys put into Scientist. Lady Ann says she too is fighting for her royalties so that her children are set before she leaves this earth. Why Did King Jammys Lie? According to The Scientist, King Jammys along with Lynval Thompson are the only people who records show are paid by Greensleeves. Lynval Thompson is also a record producer. It is in King Jammys best interest to see that Greensleeves stays viable so he can channel his music through England. The Scientist is now a big threat and hindrance to Greensleeves and King Jammys because although the US Federal Judge and Grand Jury believed King Jammys story that Scientist was too young to have so much power and skills at that young age, and he had been paid ‘work for hire’ the company RockStar settled with him out of court and paid him for his works. They obviously believed Scientist. Although they did not have to pay The Scientist and give him the copyright to his music, Greensleeves was responsible for the huge bill that had been mounting up over a three year period. The expensive lawyer fees for themselves and RockStar and all monies paid out was their responsibility. Greensleeves recently sold their company. The Scientist now has a lawsuit pending in France against Greensleeves, and his lawyer Andre R. Bertrand is engaging in actions to obtain the payment of the legal remunerations due and payable to the Jamaican artists and musicians, including Jah Life and The Scientist, who were not compensated for their work. In France, the courts want to see an actual contract showing ownership they do not recognize the concept of work for hire. This will put Greensleeves in a serious situation because if they lose in court, they could face fines of up to 180,000 Euros per violation and a violation does not mean an album but a track. Not only that, but it would set a precedence for others to follow and be compensated for their work. Calls were made to The Scientist on Sunday, March 19th 2006 and he recorded them. * it doesn't sound to me like scientist was actually smiling during these exchanges, but i couldn't believe i found a picture of the man on the phone. what can i say? fascinating stuff. thanks for the tip! I was nice and happy lurking, but I just had to stick an oar into that thread! there was some talk of remixing it when it first went up at dissensus. haven't heard anything surface yet. drop a line if you do something with it.